orbit more than one center. as it orbits the sun. only because the earth moves. to the sun’s distance to the stars. but otherwise retained Ptolemaic errors. His celestial objects sit in crystalline spheres. His orbits are circular or compounded of multiple circles. His planets move at a uniform speeds. because it was geometrically simpler. as the stationary center of an eternal universe. Nor may we have our sun as such. according to his or her own sense of what is right. 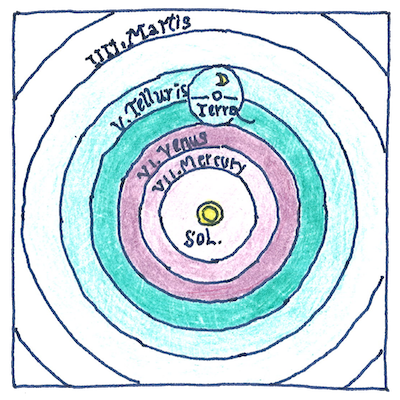 Copernicus was not the first person to propose a heliocentric universe; however, Copernicus provided a predictive mathematical model. Copernicus placed the center of the universe near but not at the sun. Understanding how gravity controls the orbits of planets and moons escaped him, as well as Kepler and Galileo. Andreas Osiander wrote an preface for the first edition of De revolutionibus orbium coelestium that stated that the Copernican theory was not intended as a description of the literal truth but only as a simpler mathematical description of astronomical observations to improve the calendar.